Is there an optimum style for running the marathon? That was the question posed by Polly McGuigan earlier this year in the run-up to this year’s London Marathon. The article was published by The Conversation and, by kind permission, is reprinted in full below. Is there an optimum style for running the marathon? 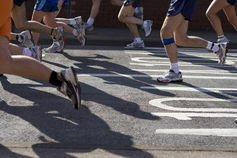 Most of the brave and hardy runners in Sunday’s London Marathon will have put themselves through a lengthy training programme to build up strength and stamina as well as physical and mental fitness. They will also probably have been bombarded with information from running magazines, sports technology and footwear companies and fellow runners about the best way to run, the best kit to wear, how to avoid injury and how to increase performance. But is there a best way to run? There is an ongoing debate among the scientific and running communities about the best way to run. In 2010, Harvard professor Dan Lieberman and colleagues put forward a logical and well-reasoned argument that humans had evolved to run with no shoes on their feet and that the development of the built-up sole in modern training shoes had changed the way we run. Data showed that Kalenjin tribesmen from the Rift Valley in Kenya, who routinely run barefoot, didn’t strike the ground with their heel but with the ball of their foot, because it hurt to strike the ground with their heel. But because modern trainers protect feet with a large, built-up sole the majority of people who run in them strike the ground with their heel first. It was proposed by Lieberman and team that this change in foot-strike pattern could potentially reduce running performance and increase the risk of getting injured. To work out whether this argument is true, it’s important to understand how the leg functions during a run. When we run, we bounce along from one leg to the next and when each leg strikes the ground, some of the energy of that impact is stored within the elastic structures of the leg (the tendons and ligaments). When that leg pushes off the ground again, the elastic structures recoil and that energy is recycled to help power the runner into the next stride, just like a pogo stick. This mechanism is hugely important to run efficiently and is one of the reasons why, as a species, we can run for very long periods of time compared to many other animals. The part of our foot that first strikes the ground when we run has the potential to influence which of the elastic structures in our leg can be used to store energy. When we strike the ground with our heel, the majority of the energy is stored in our Achilles tendon, but when we strike the ground with our forefoot, there is potential that some energy will also be stored in the elastic structures of our foot. This could mean that more of the total energy of impact is stored, rather than absorbed by other tissues in the leg. However, in order to control the foot during a mid or a forefoot landing, it is necessary to generate more force with your calf muscles, which can be tiring. So there is a trade-off between the potential energy advantages and disadvantages. What do elite runners do? If those are the theoretical arguments, how do they translate into practice? A number of studies have shown that the majority (about 75%) of endurance runners who wear shoes will strike the ground with their heel. But if you look at the group of elite runners who start and finish the marathon first on Sunday you’ll see that many of them won’t run with a heel strike, but will strike the ground with the middle or the ball of their foot. A conclusion from this could be that better runners are more likely to be mid-foot or forefoot strikers and this must therefore be good for performance and minimising the risk of injury. However, there is a slightly complicating factor at play here: speed. The top finishers in the marathon will be running a lot faster than the bulk of the field – and when we run faster we are all more likely to shift to a forefoot strike running style. Think of yourself as you increase your running speed from a jog to a sprint – you’ll probably strike the ground with your heel when you jog, but run on your toes when you sprint. The is a simple reason for this: when you run quickly there just isn’t enough time to swing your leg far enough in front of you to get your heel onto the ground in each stride, so you put your toes down first. Elite marathon runners run at an average speed of around 20km/h which for most of us would be pretty close to sprinting, so it is no surprise that most of them don’t strike the ground with their heels. Unfortunately for most of us, we don’t have the muscular or physiological capacity to maintain this sort of pace for 26.2 miles and therefore have a greater flexibility in the way our feet can strike the ground. A number of research studies have investigated whether one type of foot strike is more efficient than the other (whether it takes less energy to get from A to B) and they’ve suggested that runners are actually most efficient in the running style that they naturally use. So the advice to those preparing specifically for a marathon should be to stick with the running style that you naturally use. Change is possible to see if it helps to run more quickly, but it takes a long time to adapt and has to be part of a longer-term plan – doing this in the run-up to a big race isn’t a great idea. Changing your running style can be introduced in a training plan. Many of the footwear companies are now marketing minimalist shoes to help with this process. 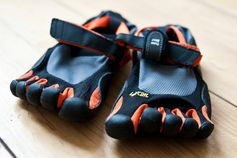 These aim to mimic a barefoot situation, in which the foot is more flexible than in a traditional modern trainer – but also to provide some protection to the sole of the foot. A recent study has shown that these minimalist shoes can help to cement a change in technique away from heel striking, because if you do it will hurt. But this is not an essential part of a technique change and it is perfectly possible to implement a change in running style with a little time and concerted effort without changing your shoes. Any change in running style will alter the distribution of load across the bones, muscles and tendons of the legs. So for those runners who have had persistent injuries such as shin or knee pain, a subtle change in running style could help to alleviate the loads on the troublesome structures, and potentially reduce the pain. But it must be stressed that any such change should be undertaken gradually as a sudden change in training load or running style is likely to cause far more problems than it will solve. Polly McGuigan does not work for, consult to, own shares in or receive funding from any company or organisation that would benefit from this article, and has no relevant affiliations.